iCliniq › Ask a doctor online › Answers › Orthopedics and Traumatology › Back Pain › Is my back pain, a nerve problem? Q. 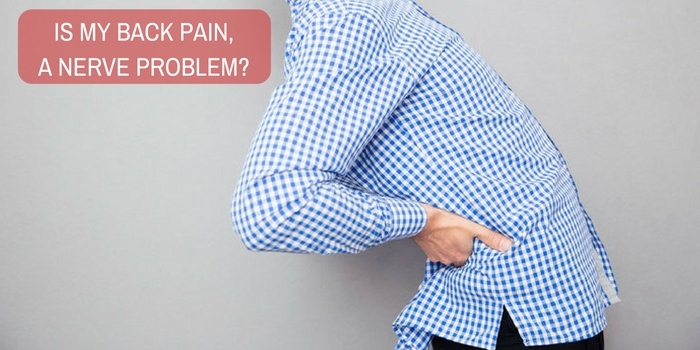 Is my back pain, a nerve problem? I am having pain in my right side lower back only if I bend or try to wear my trouser. Also, it is there if I am standing and trying to raise my leg. Even while walking I feel little pain. If I lie in bed or stand straight, then there is no pain. What is the reason and what medicine can I take? • When I start walking, the portion below the knee is numb. Why? There are three possibilities for your pain. It could be one out of these three conditions or a combination of them. Para vertebral muscle spasm or lower back strain or lumbago (low back pain). If the pain in the lower back region is unsettling for weeks, then physical examination to determine neurological deficit is indicated. My advice is to first get an x-ray of lumbosacral region of your spine and follow up with the same. Also, I would like you to answer a few questions for me. Is there any tingling or numbness sensation in your legs? Do you have any sensory loss in your legs? Does your lower back ache exaggerate on coughing, sneezing, bending sideways? If you have undergone any clinical evaluation or investigation or treatment, kindly provide the details of it. There is no tingling sensation or numbness or sensory loss. My back does not ache with coughing or sneezing. There is no pain with sideways bending. It pains a lot if I sit cross leg, getting up from bed without support and pulling my right leg up while standing. It started today and I never had it before. The chance for intervertebral disc prolapse has decreased to some extent and there is a possibility of another condition called as pyriformis syndrome (pyriformis muscle spasm in buttock region). A physical examination is required to confirm the diagnosis and treatment can be started only after the clinical examination. My recommendation is to visit your local orthopedic doctor for the same. Today, when I got up in the morning and the pain is worse. I could not stand on my right feet neither can I sit. I feel a sudden intense pain while getting up or sitting on the bed. I hope it is nothing to do with nerves? I took Mobizox yesterday and the pain went away for a while. Can I take this medicine again? Can it be nerve related? There is a high probability of your pain to be related to nerves. I suggest you Mobizox (Paracetamol, Diclofenac sodium and Chlorzoxazone) twice a day for the next seven days along with Pantoprazole 40 mg in the morning. Take an ample amount of bed rest, refrain from bending forward, lifting weights or doing any exercises. I also suggest calcium tablet and multivitamin B complex. Consult your specialist doctor, discuss with him or her and take the medicine with consent. Apply analgesic gel to the affected region and hot water bag or hot fomentation is also greatly helpful. My guess is you have not seen any doctor and not taken any proper treatment for the same. I shall be visiting the doctor today. My question is if it is related to nerves, can it be cured? Or is nerve pain a permanent one? Lower back pain is not just nerve pain or mechanical pain; there is usually a combination of two. If there is compression of nerve causing pain, then it can be cured once the pressure is relieved. Sometimes, this is achieved by medication and lifestyle modification, including exercises and while in some cases surgery is done. Most of the cases the pain can be resolved. Only in late and advanced stages the pain becomes permanent due to multifactorial involvement. I visited a doctor and had an MRI. I have attached the reports. Also, I took Mobizox and my pain is 95 percent better. My MRI says, straightening of lordotic curvature. What is that? Loss of lumbar lordosis without any other changes on MRI suggest a benign pathology. You only have strained your back muscles from an incorrect posture or lifting heavy weight. Continue the medication prescribed for 7-10 days. Take rest and apply hot water bag to the affected area. Once the pain is settled, exercises for restoration of the lumbar curvature have to be started. Now, what should I do to make my back better? Is this problem a chronic one or can get treated? Your back condition is related to bad posture and lack of back stretching exercises. If you do not exercise regularly, then the condition will progress and become chronic. Since the pain is relieved, you can start with the exercises. Refrain from any exercise involving bending forward as of now and do not lift heavy weights. Sleep on a hard mattress and continue hot fomentation. Once the pain settles, one has the tendency to stop exercise and forget about the precautions which will bring the pain back. Follow up after a fortnight of these exercises and precautions. Severe pain in the right shoulder which radiates to the whole arm.What could it be?